Making motorcycle sprockets for all makes and models since 1997. Fast Friendly reliable service. Most order ship in 1-2 days. Custom Aluminum rears Take your time look around and don't forget to check out our testimonials. Questions ? Just give us a call. We exclusively use 7075-T6 certified Aero Space grade aluminum from smelters here in the USA. 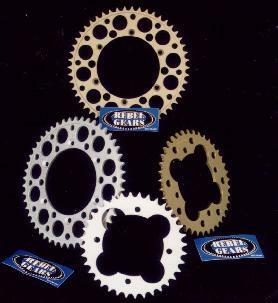 We make from 10-112 tooth in 25,35,40,415,420,428,520,525,530 and 630 chain sizes for all your rear custom sprocket needs.